© 2011 Latin Pulse Music. All rights reserved. 4:51 primer tema de Receta Perfecta por Havana NRG! 2:58 la tremenda voz de Raúl Lara, disco "Cubano Soy"
A musical companion to the My Seductive Cuba travel guide by dancer Chen Lizra, this compilation takes one on a journey of Cuban rhythms and sounds -from traditional to folkloric to modern- that deliver a great experience for listeners and dancers alike. An excellent party album and long drive soundtrack. All tracks were selected by Chen for variety and vibe. Includes extensive liner notes (6 page album booklet) and additional travel to Cuba information and resources. Imagine “Eat, Pray, Love” meets “Lonely Planet" and its all about Cuba, its people and culture. My Seductive Cuba is a great read and resource for those who have traveled, and who plan on visiting, Cuba. 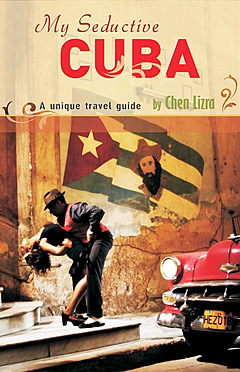 Its author, Chen Lizra, started traveling to Cuba in 2005 in order to train with the island’s best professional dancers. Each year she finds more excuses to visit Cuba, discovering the culture from within and hanging out with her close friends. Chen grew up in Israel and later moved to Canada. She holds a bachelor’s degree in business administration with a major in marketing, which allowed her to turn her passion — Cuban dance and music — into an inspiring lifestyle for others through her company, Latidos Productions®. To experience the sounds and rhythms of Cuba, a musical companion to the My Seductive Cuba travel guide is now available. With music personally selected by Chen for variety and vibe, this compilation takes one on a journey of Cuban rhythms and sounds -from traditional to folkloric to modern- that deliver a great experience for listeners and dancers alike. Musical Companion is an excellent party album and long drive soundtrack. All tracks were selected by Chen for variety and vibe. Includes extensive liner notes (6 page album booklet) and additional travel to Cuba information and resources. Regarding the development of her labor of love, Chen comments: "I’ve seen many people travel to Cuba and miss the best parts of this captivating culture. It’s not easy to enter a system that is so different than your own. Yet, Cuba offers something that no other country even comes close to. I’ve decided to write this book to help travelers get a smoother traveling experience as if your local best friend met you and showed you around. I want to intrigue those who spend time in resorts to venture out, and to help those who cannot travel get to know Cuba intimately, from the comfort of their own seat." "The book is deeply personal with my own experiences in this fun loving culture, sharing stories of possessed people, seduction, scams and much more. And yet it is a practical travel guide. The book fuses history and politics with real-life experiences among the people of this often-visited but little-understood island – Cuba on the verge of historic change. "I've always felt the need to make a difference in the world, and this is my way of doing it. What I want you to walk away with is reflecting on what is important in life. I will be truly happy if by the end of reading this book your heart will be moved. I love Cuba like home. I hope that this book will make you fall in love with it as I did."